In the meantime if you follow me on Instagram you'll be aware of my frequent love of posting my breakfast pics. Breakfast is my favourite meal of the day (lunch is a very close second), probably because its when my energy is at its highest. I namely have one of two things pretty much every morning - either a loaded smoothie, or a fruit parfait with granola. I love to use whatever I have on hand, but I also like to be creative with my fruit and flavour combinations. No surprise really then, that eventually my fondness for all things rose and pistachio would soon creep into my breakfast too. I'm not going to wax lyrical about how much I enjoy using these ingredients because my previous posts are evident enough, but I can't believe I didn't come up with this Middle Eastern inspired yoghurt parfait sooner! 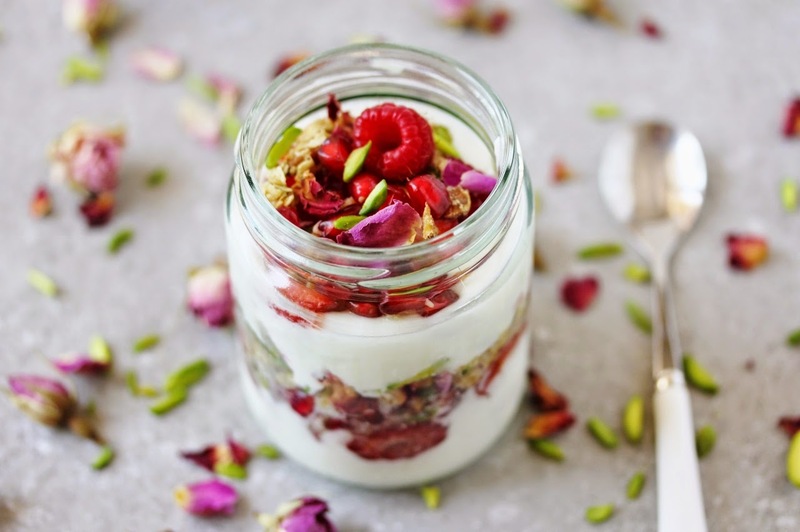 It has all the usual layered goodness of a breakfast parfait - alternating layers of yoghurt, granola and fruit, but its the rose water, orange blossom water, pomegranate, dried rose petals and pistachio slivers here which give it that Arabian touch. What's even better is that this parfait can equally double up as a healthy dessert treat. Mixed into the yoghurt, both the rose and orange blossom lend that subtle floral aroma which I so love in desserts - and it is quite subtle here, as you don't want it to be too overpowering for breakfast! Raspberries and pomegranate arils make up the fruit layer, because these complement the flavours so well both visually and in taste, and of course pomegranate carries on the Arabian theme. The pistachio and dried rose petal granola provide the necessary crunch we all need in a breakfast parfait, and can really just be mixed into whatever granola you already have on hand. Since I don't believe something like breakfast should be made to the T, please feel free to change around the fruits, type of granola, or yoghurt you use. I used plain yoghurt instead of Greek as I find its less heavy on the stomach, and I also think strawberries would be a good substitute or addition to the fruit layer. There's no added or refined sugar here too - just a drizzle of honey for a touch of sweetness. 1. In a small bowl mix the rose and orange blossom water into the yoghurt. 2. Mix the pistachio slivers and dried rose petals into the granola. 3. In a jar, glass or bowl scoop a layer of granola to the bottom. Next add a generous amount of the yoghurt, with a drizzle of honey, before adding the fruit on top. 4. Repeat layers until the glass is full, and serve. Congratulations on your second blogiversary! Wow this looks amazing can't wait to try it! Thank you, I hope you do get to try it out! How beautiful is this breakfast parfait! I am just loving all the sweet Middle Eastern flavours going on here, definitely a recipe I need to make. This is gorgeous! Almost too pretty to eat. :) Congratulations on your 2nd blogiversary and selling your art! Oh my, this looks absolutely stunning. Too pretty. Love it. I love all your recipes, thanks for sharing. When I get time, I try them some are very easy to prepare. However, during festivals I hire caterers, so that I can spend time with my friends and family. Previously, I had trouble finding the right caterer but then with this website https://www.provilink.com I can easily get estimates from catering companies. Isn't it great? Waiting for your next blog post.